Darlene, a young widow and mother devastated by the death of her husband, turns to drugs to erase the trauma. In this fog of grief, she is lured with the promise of a great job to a mysterious farm run by a shady company, with disastrous consequences for both her and her eleven-year-old son, Eddie—left behind in a panic-stricken search for her. The story immediately grabbed my attention, starting with Eddie speeding on a highway after both his hands were severed. (Not a spoiler since it literally is in the first paragraph!) We don’t know how it happened, or why at that point, but damn—that’s a brutal, shocking way to start and I was hooked. Hannaham does an incredible job keeping you turning pages, especially with the alternating narratives in third-person for Eddie’s side of the story, and first-person for Darlene’s in the form of Scotty, the crack-cocaine to which she is addicted. Giving voice to the drug and having it “speak” for Darlene was a pretty brilliant move and it worked for me—a few chapters in I was like, who IS this?? and once it clicked for me I was even more intrigued. I’m pretty tough when it comes to dark, disturbing material but the conditions at the farm had me wincing. I later learned that this book was inspired by true events, making it even more upsetting. Hannaham also writes his scenes of abuse, manipulation, desperation, and violence in such a way that elicited a visceral reaction from me. I guess if I have one quibble about the book it may be that it was a just hair too long for me, but that didn’t take away from my reading enjoyment. 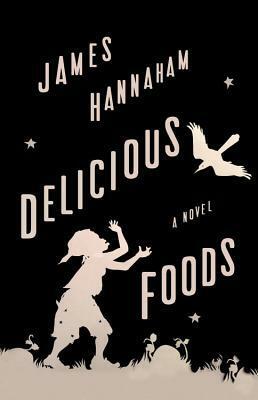 Delicious Foods is a dramatic social commentary on modern-day slavery, a shameful reality that exists in America today, as well as the power of addiction. Read from May 19 to 31, 2015. This entry was posted in books and tagged addiction, agriculture, contemporary literature, drama, family, fiction, male adolescence by kristin @ my little heart melodies. Bookmark the permalink.